Nourish your skin with vibrations of self love, and harmony with this raw rose quartz crystal infused body oil. 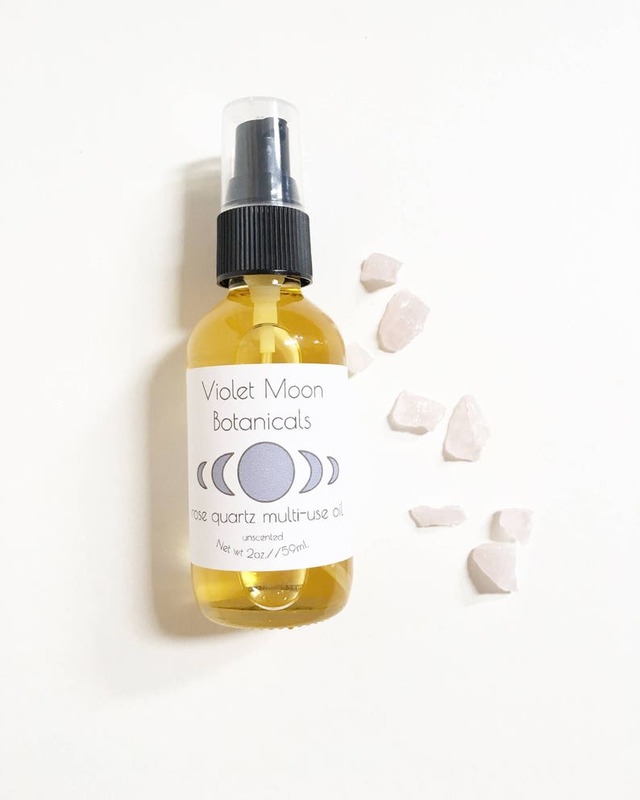 Let your skin absorb the powers of rose quartz while using this oil during a relaxing and romantic massage, in ritual uses, as a moisturizing bath oil, or as a face and body serum. 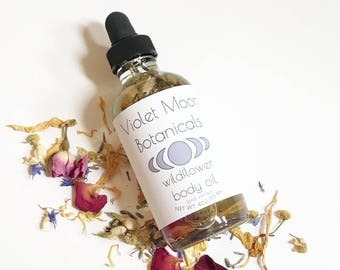 This multi-use oil contains a nourishing blend of sunflower, avocado, rose hip and jojoba oils infused with rose quartz to promote peace, love, sensuality and harmony while hydrating and deeply nourishing your skin. Chose your own scent from a variety of essential oils, for sensitive skin and facial use I recommend choosing the unscented oil. Sunflower oil is know for its non-comedogenic nature so it won't clog pores. Sunflower oil is rich in oleic acids as well as vitamins A, D and E that deeply condition skin, and leave skin hydrated and nourished. Avocado oil easily and deeply penetrates the skin to hydrate and nourish with essential fatty acids, as well as vitamins D and E that help improve skin texture. Jojoba oil is an amazing skin moisturize because it has absorption properties that are similar to our skins own sebum. Rose hip oil is a highly moisturizing oil perfect for dry mature skin. Its fatty acid content nourishes and hydrates. Rose quartz is said to be the stone of unconditional love, promoting peace, love, and harmony. Rose quartz can be used to promote love and understanding in relationships and encourage sensuality. Choose your own scent! This oil is available in a variety of scents from 100% pure essential oils. You choose from unscented, lavender scent, jasmine scent, rose scent, lemongrass scent or patchouli scent. A little goes a long way! This bottle will last for many uses. Ingredients: avocado oil, sunflower oil, rose hip oil, jojoba oil, raw rose quartz crystal. 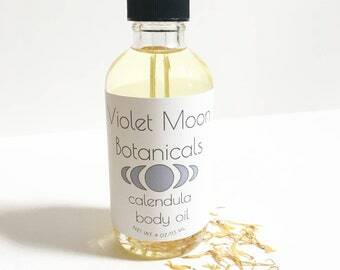 May contain the following essential oils depending on which scent you choose: Patchouli scent-patchouli essential oil, jasmine scent-jasmine essential oil, rose scent-rose geranium essential oil, lavender scent-lavender essential oil, lemongrass scent-lemongrass essential oil, amber essential oil. 1 made to order glass bottle with pump containing 2oz. 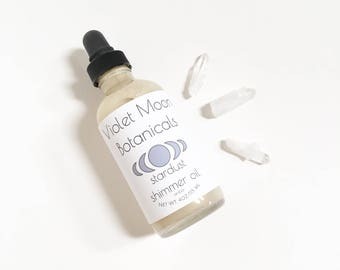 of rose quartz multi-use oil, unscented or with scent of your choice, with one to two raw rose quartz crystals inside. ***Please use caution when exiting the bath after using this product, tub may be slippery! 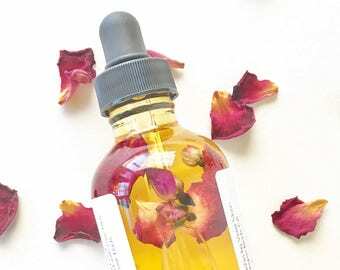 For more gem essence oils, as well as natural beauty products including natural scrubs and lotions, bathing flowers, floral bath salts, natural skin care items, vegan skincare and bath products, and other spa and relaxation gifts for her check out our etsy homepage! amazing facial oil - doesnt cause my skin to breakout! Love my oil, the smell is great and very delicate. The sample gift of the kelp soap is awesome too - I used it on my face and felt fabulous. Will order from this shop again!